In December 2012, Scenic Hudson acquired 217 acres that will increase public access through the Black Creek corridor. Trails created on the Arnika property will help connect Shaupeneak Ridge with other nearby conserved lands. Robert Rodriguez, Jr. These scenic and ecologically diverse acres fill in a critical “missing link” between our Shaupeneak Ridge preserve and the Black Creek Corridor, an ongoing collaborative initiative to protect eight miles along the creek—spanning from its mouth in our Black Creek Preserve to state-owned Chodikee Lake—and make it publicly accessible. (Only one property remains to complete this connection.) Trails created on the Arnika Property, located just 0.3 mile from Shaupeneak Ridge, would allow visitors to the popular preserve to extend their enjoyment of nature. 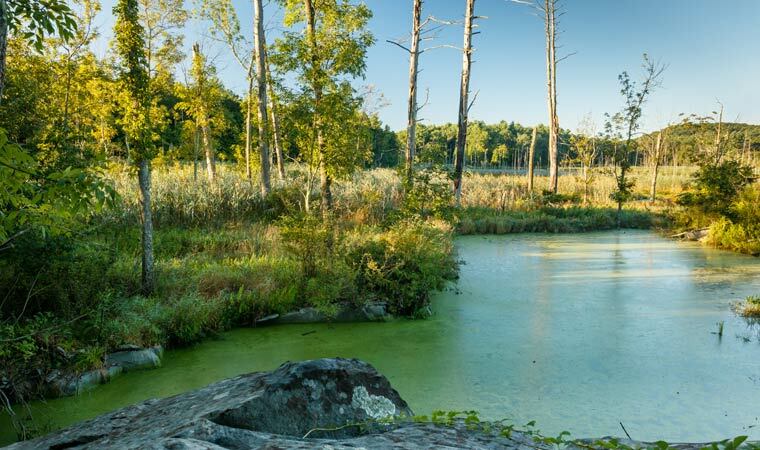 The land features forested ridges prominently visible from Route 9W and Black Creek Preserve, a pond and numerous vernal pools, as well as an 80-acre wetland that drains into Black Creek. The wetland plays a major role in purifying water before it reaches this important Hudson River tributary, a prime breeding ground and nursery for oceangoing alewives and blueback herring. The purchase is part of Scenic Hudson’s collaborative campaign to Save the Land that Matters Most, protecting lands of the great scenic, ecological and agricultural significance.